The 1948 Vincent Black Shadow was at the time the world's fastest production motorcycle. The name was changed to Vincent Engineers (Stevenage) Ltd. in 1952 after financial losses were experienced when releasing capital to produce a Vincent-engined prototype Indian (Vindian) for the US market during 1949. In 1955 the company discontinued motorcycle production after experiencing further heavy financial losses. Vincent Motorcycles, "the makers of the world's fastest motorcycles", began with the purchase of HRD Motors Ltd less the factory premises, by Philip Vincent in May, 1928. HRD was founded by the British Royal Flying Corps (RFC) pilot, Howard Raymond Davies, who was shot down and captured by the Germans in 1917. Legend has it that it was while a prisoner of war that he conceived the idea of building his own motorcycle, and contemplated how he might achieve that. It was not until 1924 that Davies entered into partnership with E J Massey, trading as HRD Motors. Various models were produced, generally powered by J.A.P. engines. Phil Vincent also experimented with three-wheeled vehicles, amphibious vehicles, and automobiles. In 1932 the first 3-wheeler, "The Vincent Bantam" appeared, powered by a 293cc Villiers engine. It was a 2.5 cwt delivery van with a car seat and a steering wheel. The Bantam cost £57-10-0 and the windscreen and hood option cost £5-10-0. Production ceased in 1936. In late 1931 Phil Irving first joined Vincent as an engineer alongside fellow-engineer E.J. Massey from the original HRD company after initially working on metallurgy for Velocette, leaving to return to his native Australia in 1949. His first engine design was an OHV 500 cc single-cylinder engine in 1934 called the "Meteor". In 1937 Phil Irving went to work for Velocette but returned to Vincent Motorcycles in 1943. Vincent primarily made munitions, but Vincent engines were trialled in boats and portable pumps during the war, and the end of hostilities saw Vincent ready to return to motorcycle production. Vincent developed a highly efficient opposed-piston two-stroke engine for use in air-dropped lifeboats, although development outlasted the war and it never went into service. Vincent already looked to the United States for sales, and in 1944 Eugene Aucott opened the first USA dealership in the city of Philadelphia. Others followed. The standard motor was known as the Meteor and the sports motor was the Comet; it was distinguished from earlier Vincent models of that name by the "Series-A" prefix. There was a TT replica & the Comet Special (basically a TTR with lights, horn etc. ), which used a bronze head. The Meteor motor produced 26 bhp (19 kW) @ 5300 rpm. The Series-A Comet could do 90 mph (140 km/h), but Phil Vincent and his racing customers wanted more. Whilst working in his office at Stevenage in 1936, Phil Irving noticed that two drawings of the Vincent HRD engine lay on top of each other in a "V" formation. He set them out on the drawing board as a v-twin engine in a frame Vincents had made for a record attempt by Eric Fernihough, who no longer required it. When Phil Vincent saw the drawing he was immediately enthusiastic, and a few weeks later the first Vincent thousand had been made, with Meteor upper engine parts mounted on new crankcases. The Vincent V-twin motorcycle incorporated a number of new and innovative ideas, some of which were more successful than others. The Vincent HRD Series A Rapide was introduced in October 1936. Its frame was of brazed lug construction, based on the Comet design but extended to accommodate the longer V twin engine. It continued the use of "cantilever" rear suspension, which was used on all Vincents produced from 1928 until 1955. Other innovations included a side stand. Innovative telescopic forks were not adopted by Vincent, with both Phils believing girder forks were superior at the time and beyond. The Series-A had external oil lines – known as "the plumber's nightmare" – and a separate gearbox. With 6.8:1 compression ratio, the 998 cc Series A Rapide Vincent produced 45 hp (34 kW), and was capable of 110 mph (180 km/h). The high power meant that the Burman clutch and gearbox transmission did not cope well. The Series B had a Feridax Dunlopillo Dualseat, and a tool tray under the front. The Series "B" incorporated an inline felt oil filter instead of the metal gauze of the Series "A". Vincent used quickly detachable wheels, making wheel and tyre changes easier. The rear wheel was reversible, and different size rear sprockets could be fitted for quick final-drive ratio changes. The brake & gear shift were adjustable for reach to suit individual feet. The rear mud guard was hinged to facilitate the removal of the rear wheel. Starting in 1948, Indian Motorcycles distributed Vincents in the United States along with other British motorcycles including AJS, Royal Enfield, Matchless and Norton. That same year an Indian Chief was sent to Stevenage to be fitted with a Vincent Rapide engine. The resulting hybrid Vindian did not go into production. The 1948 Series C Rapide differed from the Series B in having "Girdraulic" front forks – which were girder forks with hydraulic damping. By 1950, the Series C had a 998 cc, 50° V-twin that put out 45 to 55 hp (34 to 41 kW), depending on the state of tune, either Rapide or Black Shadow. The Black Shadow, capable of 125 mph (201 km/h), and easily recognised by the black coating on the engine and gearbox unit known as Pylumin, and large 150 mph (240 km/h) speedometer, was introduced. The engine produced 54 bhp (40 kW) @ 5700 rpm in Black Shadow trim. The Black Lightning was a racing version of the Black Shadow; every necessary steel part on it that could be was remade in aluminium, and anything not essential was removed altogether. These changes helped reduce the weight from 458 lb (208 kg) to 380 lb (170 kg). Every bit the racer,[opinion] it had a single racing seat and rear-set footrests. Rolland "Rollie" Free (18 November 1900 – 11 October 1984) was a motorcycle racer best known for breaking the US motorcycle land speed record in 1948 on the Bonneville Salt Flats, Utah on a Vincent Black Lightning. The picture of Free, prone and wearing a bathing suit, has been described as the most famous picture in motorcycling, and Russell Wright won another World Land Speed Record at Swannanoa with a Vincent HRD motorcycle in 1955 at 184.83 mph (297.46 km/h). The 500 cc Meteor and Comet singles were introduced, along with a 500 cc racer, the Vincent Grey Flash. The Grey Flash racer used Albion gears, for the greater choice of ratios available. The 500 cc bikes used a wet multiplate clutch, while the 998 cc V-twins used a dry, drum-type servo clutch. During the Korean War nickel chrome steel was officially regulated, meaning the correct materials for some components (e.g. gears) was not available. Some motorcycles built during this period had black rims. The term "Series D" was not used by the factory, but was taken as a natural progression by the motorcycling world, and indicates a change of the rear subframe with a new seat support, which freed the passenger footpegs from the swingarm-connected-seat struts of the Series B and C models. With sales falling, Vincent tried modernizing his existing line by enclosing the motorcycles in fiberglass bodywork; fairings, engine shrouds, and an enclosed tail section; these were named the Victor (an upgraded Comet), the Black Knight (an upgraded Rapide) and the Black Prince (an upgraded Shadow). They were poorly received by the public, and suffered delays in production, waiting for the new bodywork. A short-lived unfaired version of the Black Prince was then produced, and a Series D Comet. However, sales declined further after the post-war motorcycling boom owing to the availability of cheaper motor cars, so not many "Series D" models were made. By 1954, Vincent Motorcycles was in an increasingly difficult situation. In the quest for solvency, Vincent looked for ways to improve their position. The trike idea was revived. In 1932 "The Vincent Bantam" was first introduced: Vincent's first 3-wheeler, powered by a 293 cc SV JAP or 250 cc Villiers engine, was a 2.5 cwt delivery van which used a car seat and steering wheel rather than the standard motorcycle saddle and handlebars. The Bantam was priced at £57-10-0 with a windscreen and hood available for an additional £5-10-0. It ceased production in 1936 – the first year of the Series A motorcycle. In 1954/1955, due to falling sales of motorcycles, the prototype 3-wheeler powered by a Vincent Rapide 998 cc engine was produced. Some years later, the vehicle was named "Polyphemus" by its owner, Roy Harper. To keep development and production costs low, it used a parts-bin approach, including pieces from Vincent motorcycles, as well as wheels which came from a Morris Minor. The body was made from 16-gauge aluminium. With the standard Rapide engine, "Polyphemus" could reach 90 mph (140 km/h). Before it was sold, in the hands of Ted Davis, it achieved 117 mph (188 km/h) with a Black Lightning engine. The "Vincent 3-wheeler" was eventually sold to a member of the public for £500 – a high price for any vehicle at the time, especially for a vehicle with no reverse gear, self-starter or hood. The BMC Mini launched four years later at a price of £497. Unfortunately Vincent motorcycles were hand-built and expensive – only a total of 11,000 machines were sold post–World War Two. A sales slump in 1954 forced the company to import and sell NSU mopeds. One hundred sixty two-stroke Foxes NSU-Vincent 123 cc were built. There were also 40 98cc OHV four-stroke NSU-Vincents, and Vincent also sold the "NSU Quickly" moped; too well it appears (selling about 20,000 in one year – a footnote to how the market had changed again), as NSU took control of its own sales after a year. In an attempt to diversify the company, Phil Vincent undertook development of a version of the motorcycle V-twin for aircraft applications. Development of this engine, named Picador, began in 1951 and continued until 1954, diverting funds from the motorcycle product line. The Picador was intended to power ultra-light aircraft. In particular the engine was to be used in the ML Aviation U120D Queen Bee pilotless target drone. To qualify for the government contract the motor had to be capable of passing prolonged full power operation tests. Initially built to Black Lightning specifications, the engine followed typical Vincent practice, with two air-cooled cylinders in a 50° V-formation and with the cylinders offset to improve cooling of the rear cylinder's exhaust valve. The engine displacement was 998 cc (60.9 cu in), and it weighted 200 lb (91 kg), with a power output of 65 hp (48 kW) @ 5000 rpm. The valves were operated by rockers and short pushrods driven by two camshafts mounted high in the engine's timing case, an arrangement euphemistically called "semi-overhead camshafts". The Picador motor was upgraded with a larger mainshaft,[clarification needed] different big-ends, Scintilla magneto, and a double speed oil pump. To prevent fuel starvation during the U120D's rocket-assisted launch when accelerations of 10Gs would be generated, mechanical fuel injection driven from the propeller shaft replaced the usual carburettors. Unusually for an aircraft engine, the engine was mounted with the crankshaft transverse, although in the Queen Bee drone the engine was rotated 180° from its motorcycle applications, with the exhaust ports at the rear. An oilbath chain primary drive and a bevel gear drove the propeller with a 2:1 reduction from the engine speed. Due to ML Aviation's inability to deliver a working radio control system, Vincent did not win the contract. 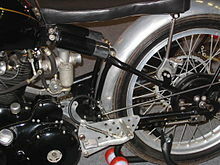 Russel Wright's record breaking bike was fitted with a Picador crank and oil pump, by Vincent, while in England for Earls Court, shortly after the 1955 record attempt. At the annual dinner of the Vincent H.R.D. Owners Club in the summer of 1955, Phil Vincent announced that the company could no longer continue in the face of heavy losses and that production of motorcycles would cease almost immediately. In 1955, one week before Christmas, the last Vincent came off the production line. The factory then turned to general engineering, the manufacture of industrial engines, and there was the Amanda water scooter. A Vincent engineer lost his life testing it, drowning at sea. Vincent engines have been fitted to other frames. The most common was the Norvin, using a Norton Featherbed frame. Other names were used, including Vincent–Norton, Vinton, and Vin–Nor. Whereas most were one-off builds, an early attempt at production was announced by Staffordshire engineer Tom Somerton in late 1959, with an intended low-volume run from 1960. It's not known how many were completed. New Norvins were announced by Hailwood Motorcycle Restorations in 2008, a brand associated with David Hailwood (Mike Hailwood's son) and bike restorer John Mossey. The business soon was dissolved. The Norvin is now available from John Mossey under a new brand, JMC Classics, together with the Egli-framed Vincent. Fritz Egli, a specialist frame manufacturer based in Switzerland, produced an Egli-Vincent, and around 100 were produced between 1967 and 1972. [clarification needed] Egli-Vincents were subsequently built under licence in France by Patrick Godet. JMC Classics also produce new Egli framed Vincents in UK. In 1996, a new motorcycle company was formed by three individuals, Rodney Brown (a metallurgical engineer), Terry Prince (a Vincent enthusiast and specialist) and Ron Slender. Brown provided the financial start and along with Prince were the founding directors, with Slender specialising with business development post-production. The company was named RTV Motorcycles. Its ambition was to produce a modern-day classic Vincent motorcycle that could be marketed, in reasonable volumes, worldwide. 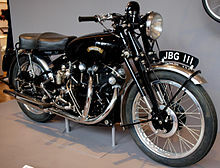 It used a redesigned and modernised version of the Vincent engine, engineered by Prince, with an increased capacity and in an Egli-style frame. The motorcycles were to be built individually by hand. The range was to include both a touring and sports model in capacities of 1,000 cc (RTV1000) and 1,200 cc (RTV1200). Complete new engines would also be made available for separate purchase. Production was initially to begin for the larger capacity machine designated the RTV1200. These were to be fitted, as standard, with state of the art Bosch electric start, Brembo brakes, adjustable Paioli upside down forks, Ohlins rear monoshock and V-2 multiplate clutch. The first factory prototype RTV was built in 1998; other RTV prototypes were in various stages before the company went into voluntary liquidation towards the end of that year. Vincent Motors USA founder and president, Bernard Li, acquired the Vincent trademark in 1994 and formally launched Vincent Motors USA in 1998, spending about $2 million building prototypes that resemble the original Vincent but utilised modern components like the Honda RC51 V-twin engine. Vincent Motors was based in San Diego. A resurrection of the Vincent name is now unlikely as the RC51 engine is out of production, and Li was killed in a single-bike crash in Arizona in 2008. The Irving Vincent is produced in small numbers by HRD Engineering (Horner Race Development - Ken and Barry Horner) in Hallam, Victoria, Australia. It is a re-engineered version based on the original Phil Irving drawings, with engine capacities of 1000 cc, 1300 cc or 1600 cc. Apart from the basic elements of the design, the Irving-Vincent was fully updated, with modern metallurgy, casting and milling allowing far stronger engine construction. The first Irving-Vincent was 1299cc in capacity, had a 14:1 compression ration, ran on ethanol and developed around 135hp. Subsequent models increased the engine capacity to 1,571cc, developing 165hp, followed by a four-valve, fuel injected engine of 1,600cc developing 180hp and a top speed of nearly 170mph.. The marque gained worldwide recognition by winning the Daytona (Florida, US) 'Battle of the Twins' in its first attempt in 2008, ridden by Craig McMartin. Plans were made to return to Daytona for the 'Battle of the Twins' with the 1,600cc engined model, but this didn't happen. Wikimedia Commons has media related to Vincent motorcycles. ^ Ward, Ian. Great British Bikes. Macdonald & Co. ISBN 978-0-7481-0020-0. ^ a b "The Club — The Marque's History". www.voc.uk.com. Archived from the original on 12 January 2018. Retrieved 11 January 2018. ^ a b "Vincent". www.3wheelers.com. Archived from the original on 28 October 2016. Retrieved 11 January 2018. ^ "Vincent Motors History". Vincent Motors. Vincent Motors, USA. 2004. Archived from the original on 2 July 2010. Retrieved 22 October 2006. ^ "NTNOA Histories − The Vincent". www.ntnoa.org. Archived from the original on 9 January 2018. Retrieved 31 January 2018. ^ a b "British motorcycle manufacturers - V". www.ianchadwick.com. Archived from the original on 27 May 2017. Retrieved 12 January 2018. ^ a b Bickerstaff, J P (1997). Original Vincent Motorcycle. Bideford, Devin UK: Bay View Books Ltd. ISBN 978-1-870979-83-2. ^ "Vincent Motorcycle Models". thevincent.com. Archived from the original on 3 December 2016. Retrieved 22 October 2006. ^ Greg Williams (September – October 2009). "The Last Vincent Black Lightning?". Motorcycle Classics. Archived from the original on 3 December 2010. Retrieved 27 October 2010. ^ "Motorcycle: Vincent". is-it-a-lemon.com. Archived from the original on 17 March 2006. Retrieved 22 October 2006. ^ Clement Salvadori (March – April 2007). "Riding the Big Sur on a 1950 Vincent Series C Rapide". Motorcycle Classics. Archived from the original on 14 November 2010. Retrieved 27 October 2010. ^ Ensanian, Greg (22 November 2016). Discovering the Motorcycle: The History. The Culture. The Machines. Equus Potentia Publishing. p. 414. ISBN 978-0996391900. Retrieved 31 December 2017. ^ "Grey Flash Motorcycles". thevincent.com. Archived from the original on 19 August 2009. Retrieved 22 October 2006. ^ Baltusnik, james. "Production and Shipment of Vincent Motorcycles". www.thevincent.com. Archived from the original on 13 May 2017. Retrieved 27 April 2018. ^ a b Guyony, Philippe (1 December 2016). Vincent Motorcycles: The Untold Story since 1946. Veloce Publishing. ISBN 9781845849023. Archived from the original on 26 December 2017. Retrieved 27 April 2018 – via Google Books. ^ Green, Peter. "Vincent Firefly". The Moped Archive. Archived from the original on 26 September 2007. Retrieved 22 October 2006. ^ "A glance at the history of this legendary car". Archived from the original on 21 July 2010. Retrieved 11 January 2018. ^ Baker, Alan (5 June 1953). "POWER for ULTRA-LIGHT AIRCRAFT". Flight: 721–724. Archived from the original on 27 December 2017. Retrieved 26 December 2017. ^ "Guided Midget". Flight: 254–256. 28 August 1953. Archived from the original on 5 December 2013. ^ "Vincent Motorcycle - Miscellaneous Information". thevincent.com. Archived from the original on 12 November 2006. Retrieved 22 October 2006. ^ "History - Page 3". Vincent Motors. Archived from the original on 5 December 2008. Retrieved 22 October 2006. ^ Big Sid. "Last Train to London". MindSpring. Archived from the original on 2 September 2006. Retrieved 22 October 2006. ^ "Home". www.vincentspares.co.uk. Archived from the original on 20 August 2016. Retrieved 27 April 2018. ^ "Vincent HRD Owners Club". www.voc.uk.com. Archived from the original on 30 September 2017. Retrieved 27 April 2018. ^ Ash, Kevin. "Vincent replicas: quality and nostalgia". The Telegraph. Archived from the original on 2 April 2017. Retrieved 3 April 2018. ^ "Hailwood Motorcycle Restorations Ltd". Companies in the UK. Archived from the original on 3 December 2013. Retrieved 2 December 2013. - Incorporated March 2008. First strike-off April 2010, Dissolved February 2011. ^ "Egli-Vincent". Godet Motorcycles. Archived from the original on 15 October 2006. Retrieved 22 October 2006. ^ Allen, Guy (14 January 1998). "Scoop RTV1200 ride". Australian Motorcycle Trader. pp. 6–7. Archived from the original on 11 June 2012. Retrieved 29 July 2012. ^ Brown, Rodney. "History of RTV Motorcycles". The A - Z of motorcycles. Archived from the original on 3 March 2016. Retrieved 29 July 2012. ^ "Rebirth of a legend". Vincent Motors. 1 August 2005. Archived from the original on 1 August 2005. Retrieved 22 October 2006. ^ Edwards, David (6 May 2008). "Bernard Li, 1946-2008 - First Look". Cycle World. Archived from the original on 12 July 2013. Retrieved 2 June 2014. ^ Cameron, Kevin (29 September 2008). "The Irving Vincent: A Modern, High-Performance Black Lightning - First Look". Cycle World. Archived from the original on 12 January 2016. Retrieved 31 May 2014. ^ "Irving Vincent 1600 Daytona: Simple is best". Motorcycle Sport and Leisure Magazine. 1 July 2011. Archived from the original on 1 June 2014. Retrieved 31 May 2014. ^ a b c d e Cormier, Jason. "The Irving-Vincent - Anachronistic Trackday Missile". www.odd-bike.com. Retrieved 14 March 2019. ^ Walnecks Classic Cycle Trader June 2008. Causey Enterprises, LLC. p. 21. Retrieved 31 May 2014. ^ Cathcart, Alan (9 March 2012). "AMCN: Simple Is Best". motoring.ninemsn.com.au. Archived from the original on 1 June 2014. Retrieved 31 May 2014. Harper, Roy (1985). Vincent Vee Twins – The famous 1000 series, plus 500 singles. 12-14 Long Acre, London: Osprey Publishing Limited. ISBN 978-0-85045-435-2. Harper, Roy, ed. (2008). 1908 - 2008 P.C. Vincent The Snarling Beast. Vincent Publishing Company. ISBN 978-0-905943-20-6. Preece, Geoff (14 November 1992). HRD Motor Cycles: Produced by a Rider. J. Bickerstaff. ISBN 978-0952029205. Vincent, Philip C. (October 1977). Vincent: 50 Years of the Marque. Vincent Publishing Company. ISBN 978-0905943008. Wright, David (24 November 2002). Vincent: The Complete Story. Crowood Press. ISBN 978-1861265166. Wright, David (2005). Vincent and HRD Motorcycles: How They Were Promoted and Sold. Amulree Publications of Laxey.